Last week I discovered the Organic Emporium. The Organic Emporium is run by Debbie Logan and it sells organic, grass-fed produce online. You place your order and simply have it delivered or you can pick it up. I picked up 100% Kalahari Grass Fed sirloin steaks, mince, stock bones and Mooberry Farm Grass Fed butter, Free Range eggs and milk. Needless to say I will be going back for more! 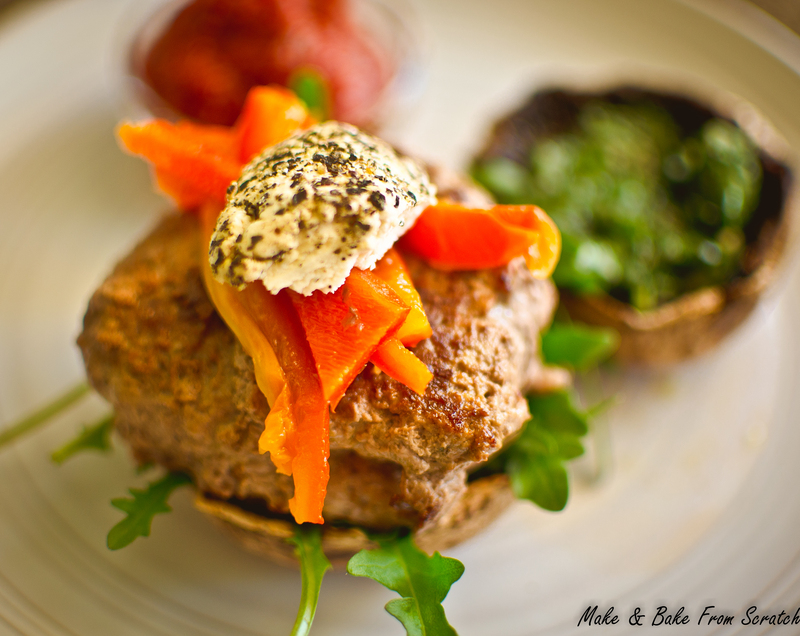 After a roaring kettlebell session on Saturday I came home and made 100% Kalahari Grass Fed Burgers with the mince. Since I do not eat gluten I like to get creative, so I used large flat mushrooms for the buns. On the burger I added homemade tomato sauce, homemade basil pesto, roasted red pepper, rocket and goats cheese. What better way to replenish your body after working out? Of course, you could gobble these up at any stage of the day. Sweet potato wedges roasted with coconut oil and spices make a delicious side dish. This recipe is gluten-free, high protein, good fats and oozing flavour. For the burgers: In a large bowl mix all the ingredients. Roll the mixture into beef pattie shapes. In the pan melt 1 teaspoon coconut oil/ghee and cook patties 8-10 minutes on each side (this will vary with individual taste). Mushroom Buns: Heat grill, add ½ teaspoon of butter and black pepper to each mushroom, grill for 20-25 minutes and ensure each mushroom is cooked right through. Roasted Red Pepper: Preheat oven at 180 degrees. Chop and de-seed red pepper, place on a flat lined baking tray and add 1 teaspoon coconut oil, roast for 25 minutes until the pepper is nice and soft. Homemade Tomato Sauce: In a mixing bowl add all ingredients; remember to melt the honey it will mix better. Combine all ingredients and pop in a glass jar, store in the fridge. Once everything is ready to devour plate up and enjoy a wholesome home cooked meal.